In the canon of the Alien franchise, it’s always been assumed that if the aliens made their way to civilization, they would be an unstoppable force, toppling everything we’ve built. Such was the case among the small pocket of colonists in Aliens. But that film took place in the future, far away in time and place from contemporary earth. The first Alien vs. Predator film took place in modern times, but writer/director Paul W.S. Anderson went to some lengths to ensure there was no plausible chance the aliens could threaten civilization, placing the action in his film on a remote Antarctic island under 2,000 feet of ice. Why such reluctance to show aliens tearing up Times Square, say, or climbing the towers of the Golden Gate Bridge? Despair, I think. The series has set the aliens up as such a malevolent collective that it is very difficult to pluck the creatures out of isolation and still have hope for a happy ending. They would inflict such a rapid unbalancing of local ecology, beyond anything we know of out here in the real world, that it would break viewers’ connection to the story. Also, the CGI bill would be enormous. That didn’t stop The Brothers Strause (Greg and Colin). From a script by Shane Salerno (part of the writing team behind the execrable Armageddon), Alien vs. Predator: Requiem takes place in the real town of Gunnison, Colorado, population 5,873 (although the film was shot in and around Vancouver). In the film, Gunnison sits in a bowl, and there appears to be only one road in and out of town. So the setting is civilization, but removed enough that it mimics isolation. We viewers, then, have been tricked into thinking the stakes are higher in this film. For shame, Brothers Strause. Anyway, Requiem takes place immediately following the events of the previous film. The hero predator from that production, now deceased, was infected with an alien embryo, and it bursts out of his chest while the predator spaceship is still in orbit around earth. The new alien, endowed with physical characteristics from its host, wreaks havoc aboard the ship and it ends up crashing in the woods outside Gunnison. The alien, along with some alien face-huggers, survive, and begin making their way to the hapless town. Meanwhile, Dallas Howard (Steven Pasquale), an ex-con from Gunnison, returns home after his stretch in prison. He’s a real tough guy. His hair is perfectly styled, he’s shaved, his clothes are clean and non-offensive, and he’s polite. This is Gunnison’s resident bad boy? He’s met by the local sheriff, Eddie Morales (John Ortiz), and…you know what? This is one of those movies where character development simply does not matter. 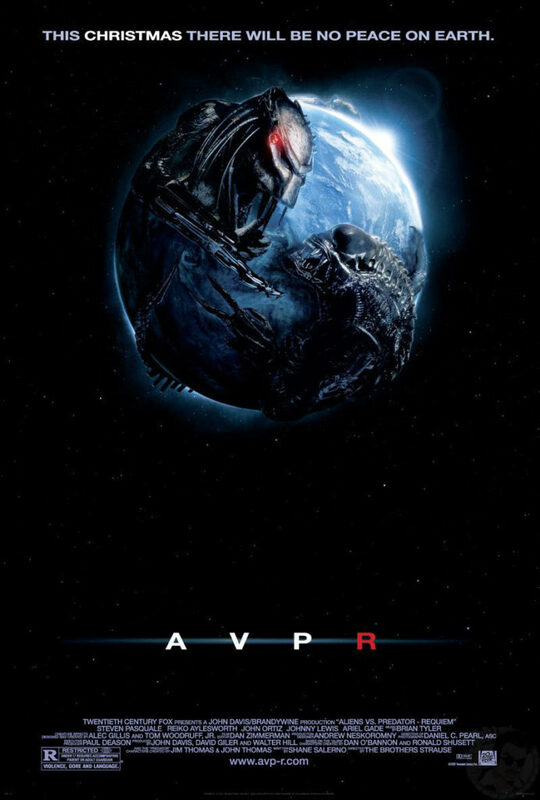 The film is titled Alien vs. Predator. Any people in this flick are mere fodder for the main action. Suffice it to say, a group of diverse townsfolk end up grouping together in an effort to flee the danger, and the film follows them as they are whittled down one by one in gruesome fashion. The human part of the story needs no further explanation. The scenes featuring the aliens and a predator who arrives on scene to hunt them are decent enough. The aliens run through town, create a whole bunch more aliens (in some extra-canon trickery designed to hurry things along), and kill many, many people. These are the parts in this film that work. Especially the alien that popped out of the predator. It was Alien 3 that first broached the idea that the aliens share physical characteristics with their hosts. In having one that’s part predator, this film adds an excellent bad guy to the series. But I can’t imagine a 90-minute production being nothing but screeching aliens and a growling predator doing battle. There has to be something in between, and what we get is a pile of cheap horror boilerplate. It’s not done poorly, but it is forgettable. There’s nothing remarkable about the people who populate the film, or their personal stories. This mediocrity so overwhelms the rest of the film that it makes the entire experience forgettable. There is a good Alien vs. Predator film waiting to be made. What the Strause brothers, and Anderson before them, have done is prove that this good idea has a higher degree of difficulty than perhaps anyone had thought.